The Egyptian scarab beetle is the personification of the scarab god Khepri , a solar god of resurrection. As the scarab pushes its dung behind it in a ball, so the Egyptians thought that Khepri pushed the sun across the sky. Young scarabs emerged, born out of the dung, and so the scarab also came to symbolise new life and creation. The scarab was also linked to Amen, as was Khepri himself. Appearance: The particular species of beetle represented in the numerous ancient Egyptian amulets and works of art was commonly the large sacred scarab (Scarabaeus sacer). This beetle was famous for his habit of rolling balls of dung along the ground and depositing them in its burrows. The female would lay her eggs in the ball of dung. When they hatched, the larvae would use the ball for food. When the dung was consumed the young beetles would emerge from the hole. 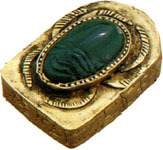 Millions of amulets and stamp seals of stone or faience were fashioned in Egypt depicted the scarab beetle. Meaning: It seemed to the ancient Egyptians that the young scarab beetles emerged spontaneously from the burrow were they were born. Therefore they were worshipped as “Khepera”, which means “he was came forth.” This creative aspect of the scarab was associated with the creator god Atum. The ray-like antenna on the beetle’s head and its practice of dung-rolling caused the beetle to also carry solar symbolism. 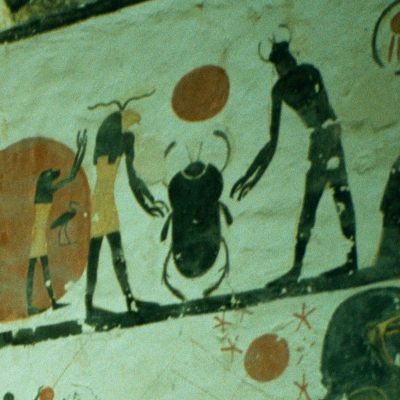 The scarab-beetle god Khepera was believed to push the setting sun along the sky in the same manner as the bettle with his ball of dung. In many artifacts, the scarab is depicted pushing the sun along its course in the sky.